There is an island in the North Atlantic where people have been looking for an incredible treasure for more than 200 years. 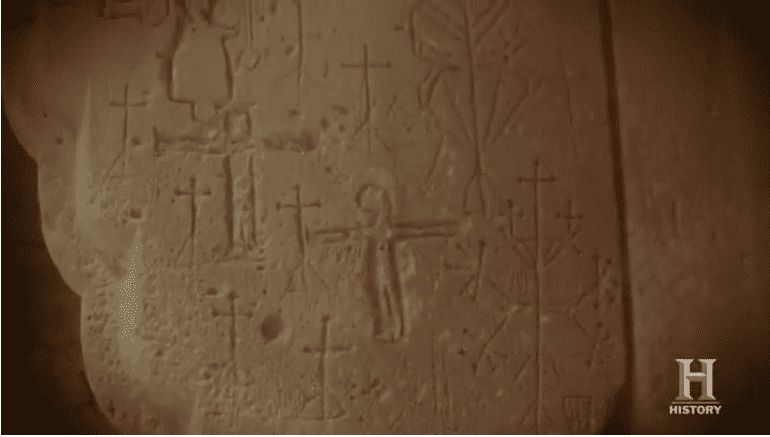 So far, they have found a stone slab with strange symbols carved into it mysterious fragments of human bone and a cross whose origin may stretch back to the days of the Knights Templar. To date, six men have died trying to solve the mystery and according to legend one more would have to die before the treasure can be found. It is the start of another promising day on Oak Island as Rick Lagina calls his brother Marty from the war room to report from the team’s recent progress. 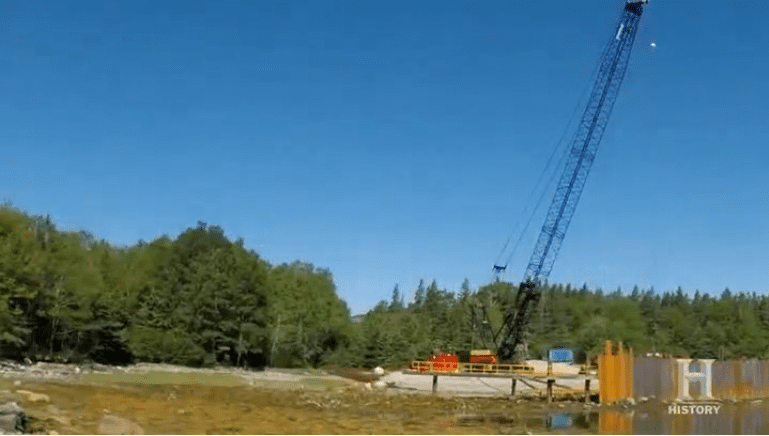 Four weeks ago, Rick, Marty and their partners along with the team from Irving Equipment Limited began construction on their most ambitious and costliest project to date – a 525-foot-long steel cofferdam surrounding Smith’s Cove. So far, nearly all of what will be 117 interlocking steel sheets have been driven some 25 feet deep into the seabed. This will allow the team to effectively seal off Smith’s Cove from the Atlantic Ocean, drain the area and then conduct an intensive excavation. In past years all of the spoils had to be painstakingly washed and then carefully sifted by hand. The process was not only messy but was so slow that much of the material couldn’t be examined for several days or in some cases months. Following the call with his brother Marty, Rick Lagina, Charles Barkhouse, Dave Blankenship and Dan Henskee head to Smith’s Cove. The team from Irving Equipment Limited is about to complete construction of the massive steel cofferdam. Before the team can begin their excavation of the cove the entire area must be completely drained which is more than 100,000 gallons of seawater. To accomplish this the team will be using two 12 horsepower sump pumps each running 15 hours a day. Later that day as the team begins preparations to drain Smith’s Cove, Jack Begley, Charles Barkhouse and researcher Doug Crawl install a new artifact for display at the Oak Island interpretive center. For more than two centuries, the 90-foot stone has been the subject of numerous theories speculations and myths. it was discovered in 1804, while treasure hunters were excavating the original money pit. At every ten feet they found evidence of wooden platforms made of oak planking but when they reached a depth of 90 feet they discovered a large ball of colored slab with a series of strange markings carved into it. When the stone was first removed it seemed to trigger a booby trap which flooded the money pit – a situation that continues to plague that area of the island to this day. Two years ago, Doug, Charles and Alex Lagina visited the Nova Scotia collet, the place where the 90-foot stone was laid hoping to find if not the actual stone information that might lead to its current whereabouts. But after searching through a virtual maze of basement corridors and crawl spaces they found no sign of the mysterious artifact. Following the operations at Smith’s Cove Rick Lagina, Dave Blankenship and geophysical engineer John Monocot travels some 20 miles southwest to the town of Bridgewater, Nova Scotia. They have come to check out an industrial sized wash plant, one they hope will be able to process the massive amount of spoils that will be dredged up during the excavation of Smith’s Cove. 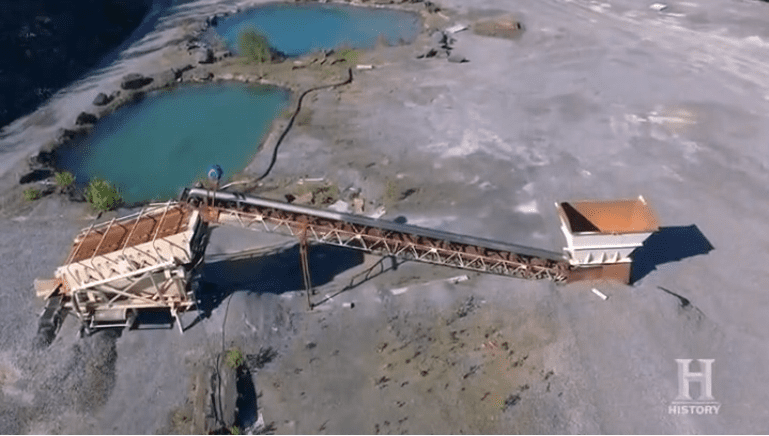 As each load up excavated material or spoils is fed into the hopper they will be transported by way of a conveyor belt up and into a heavy-duty grade which will filter out any large rocks or debris. The remaining smiles are then distributed onto two separate shaker decks where they are then sorted according to size. Soil and bits of sediment are literally shaken off as a series of fixed spray nozzles wash the spoils clean but they are then deposited into uniform piles that will be further examined by hand for possible artifacts or hopefully evidence of treasure. A ramrod an object used in the loading of muskets and early rifles from the early 18th to mid-19th centuries has been discovered. The land pattern musket nicknamed Brown Bess was standard issue among members of the British Army Gary in the team have found a number of artifacts at lot 24 including British musket balls and uniform buttons which indicated that Oak Island was once used as an 18th century military encampment probably during the time of the American Revolution. However, there was something else, even more stunning. A bone! If the bone is determined to be a human origin, it could be one of the team’s most significant finds. It could provide an important clue as to who was on the island prior to the discovery of the money pit in 1795 pottery, possibly from the early 1700’s and found buried with a piece of bone. Prior to the discovery of the money pit, not much is known about the history of Oak Island or details about the area’s early inhabitants. In addition to the indigenous peoples and Spanish sailors were known to frequent the waters of Nova Scotia’s Mahone Bay as early as the 16th century. Later visitors included the French and English many of whom settled here and began to develop Oak Island as a place for farming and grazing livestock. 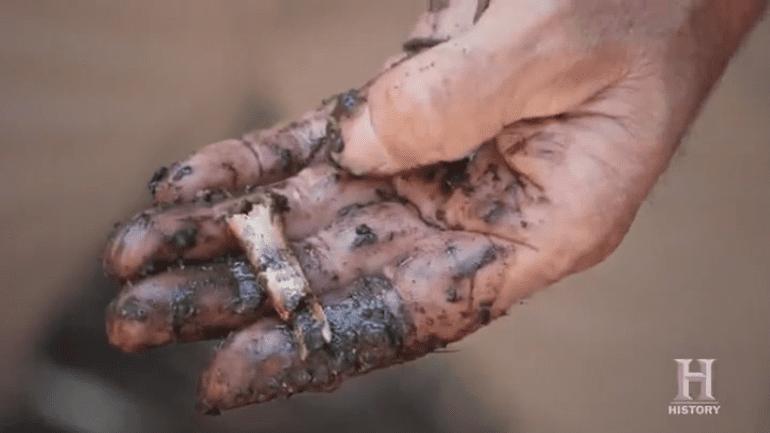 If the bone in pottery fragments can be definitively dated to sometime before the late 1700’s it could give insight not only to who may have inhabited Oak Island hundreds of years ago but what they were doing here. After discovering what could be a significant new search site, Alex has asked his uncle Rick Lagina to come and examine the team’s recent finds. Although the team would like to continue searching for artifacts on lot 24 they are required by the province to suspend further exploration of the area until they are joined by authorized archaeologists Laird Niven. For generations of treasure hunters, Smith’s Cove has been the starting place for the entire Oak Island mystery. It is here that a battling network of stone box drains were discovered in 1850 and all of their purpose is still not entirely known. The bow strings are believed to be the entrance point for the ocean water that fuels the booby-trapped flood tunnels. It is also at Smith’s Cove where Rick Lagina and Gary Drayton bade what is arguably one of the team’s most important discoveries – a cross that yearly matches a carving Rick found on the wall of a 14th century Templar prison last year. If the elaborate wash system is successful at retrieving more important artifacts during their excavation of Smith’s Cove, all of the hard work and millions of dollars invested will worth it. As the team begins assembling the massive wash plant at Smith’s Oak Island historians Doug Chrome and Charles Barkhouse along with Jack Begley head to Halifax, back to the side of the bookstore where the 90-foot stone was last seen. It is now the home of the Nova Scotia College of Art and Design. The team found what they believe is the legendary stone. According to reports, the so-called 90-foot stone was taken to the city of book bindery closed in 1919 the stone seemed to vanish without a trace. In the city of Halifax, the team is exploring the basement of the building of Oak Islands infamous 90-foot stone was last seen more than 100 years ago. In 1909, upon hearing reports that the 90-foot stone was on display in a Halifax book store, Oak Island treasure hunter Captain Henry L Bowden traveled there to see it firsthand. He was hoping that by finding the original stone and carefully examining the carved symbols and markings he might be able to find clues in the stone that had been previously overlooked. Unfortunately, when he arrived he was horrified to discover that the stone was being used as a slab for beating and cutting leather and that years of repeated blows from the book binders hammer had left the inscriptions so damaged that it was almost completely worn away. The only carvings on the stone that Bowden could make out were the initials L and N but nothing similar to the symbols that had earlier been reported. Bowden left the book bindery both disappointed and empty-handed. in 2002 a team of researchers from Wessex Archaeology conducted a high-tech examination of, using high-resolution laser scanners capable of recording details as small as half a millimeter they discovered numerous carvings that have been impossible to detect with the naked eye. 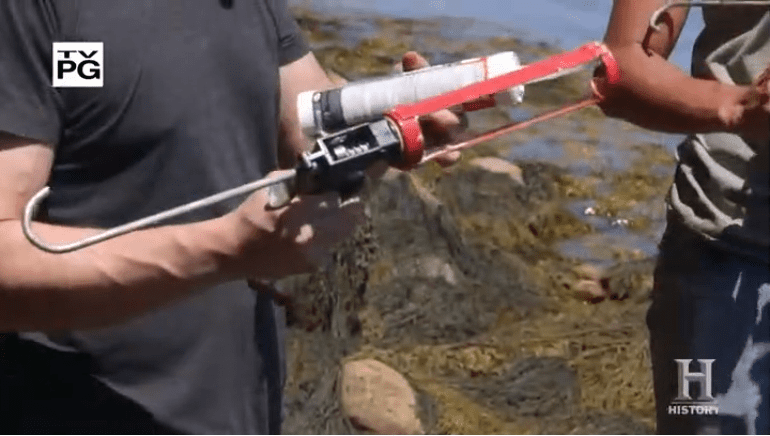 Could this same technology allow the team to recover markings on the suspected 90-foot stone that could help them find the Oak Island treasure? 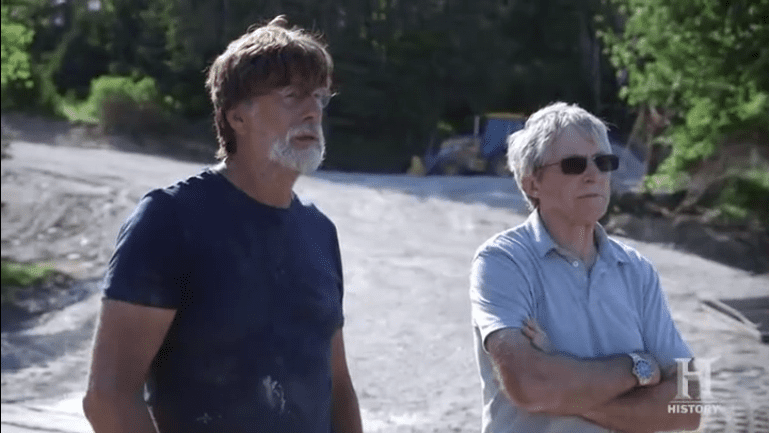 As Jack, Doug and Charles continue their search for the 90-foot stone, Marty Lagina returns to Oak Island eager to get a first-hand look at the team’s progress while he was away. He is surprised with the work done by the point of his return and the brothers go to the Smith’s Cove together. in the early 1970’s, Oak Island resident and veteran treasure hunter Dan Blankenship conducted his own large-scale excavation of Smith’s Cove. It was then while searching for evidence of the legendary flood tunnel box drains that Dan made an unusual and astonishing find – a 65-foot-long wooden u-shaped structure located some 10 feet deep and on it were carved a series of Roman numerals. But before Dan could carefully examine his mysterious new discovery severe storms destroyed the cofferdam and once again buried the u-shaped structure that it hasn’t been seen since. The next morning, Rick Lagina and Craig tester head to Smith’s Cove they are eager to see if efforts to drain the newly enclosed area If they are successful, the team will be able to safely excavate the cove in hopes of rediscovering the mysterious new shaped structure. What Rick and Craig have noticed is not a good sign any leak no matter how small will force the team to shut down the entire Smith Cove operation! Finding what now appears to be several leaks in what was supposed to be a watertight barrier is a devastating development for Rick, Marty and their partners. It could mean that after one year of planning and more than 1 million dollars invested the operation at Smith’s Cove is over before it begins. Following the discovery that the steel cofferdam at Smith’s Cove has developed a large number of leaks, Rick Lagina and his partner Craig Tester have placed an emergency call to representatives from Irving equipment limited. The team is advised to use adhesive materials to repair the damage. With applications ranging from common home repairs to commercial construction and manufacturing silicone is a rubber like adhesive capable of creating a flexible bond it is also highly resistant to water friction and extreme temperatures. The next morning, Rick Lagina along with his nephews Alex Lagina and Peter Fornetti join metal detection expert Gary Drayton and archaeologist Laird Niven on lot 24. 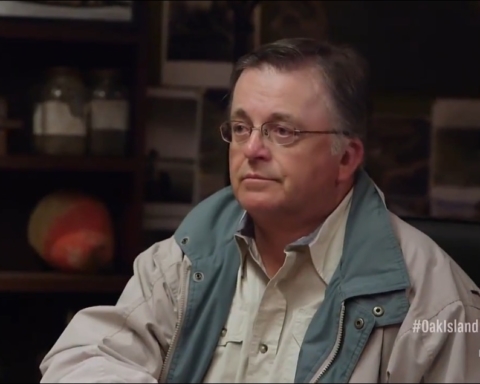 Although the ultimate goal of the Oak Island team is not to find pottery and pieces of antique metal, they are hoping that by carefully searching for and examining man-made artifacts they can piece together a virtual timeline of what might have happened on Oak Island prior to the discovery of the money pit in 1795. So far, the team has found evidence not only a British but also French and Spanish activity on Oak Island dating as far back as the 17th century. Archaeologist Laird Evan begins to carefully excavate the mysterious site on lot 24. Brothers Rick and Marty Lagina head to the war room or they have called an important meeting with members of their Oak Island. 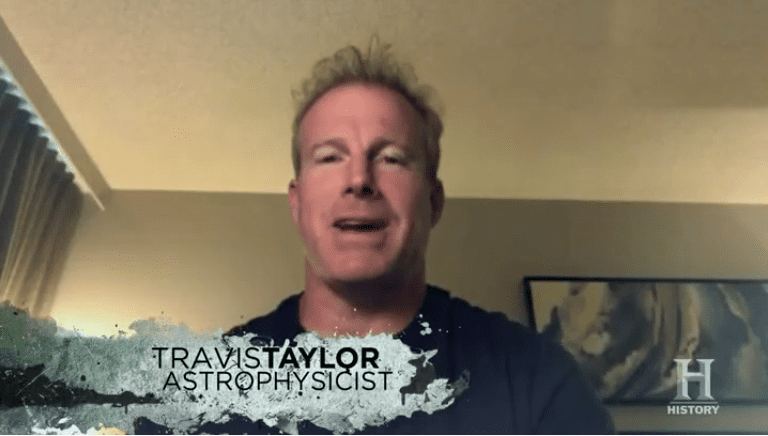 Dr. Travis Taylor is an astrophysicist and aerospace engineer with degrees in the fields of optical sciences quantum physics and astronomy. 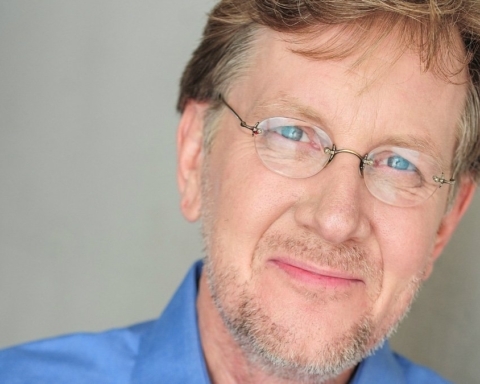 He has also spent more than two decades working closely with the United States government on numerous classified programs for both NASA and the Department of Defense. Earlier this year the Laginas and their partners commissioned Eagles Canada, a geophysical exploration company, to conduct extensive seismic testing on Oak Island. The process involved the detonation of more than 1,500 dynamite charges which sent shock waves deep into the earth. After these waves were carefully recorded and measured the team was presented with a virtual map of possible tunnels chambers and anomalies that might live as much as two hundred feet deep underground. Although the seismic maps have led the team to discover incredible new evidence the precise whereabouts of the treasure vault remains a mystery. Peter Fornetti begin the process of patching the massive steel cofferdam at Smith’s Cove. Because the silicon-based caulking compound must be applied on the ocean side of the wall, Alex and Peter need to work quickly while the tide is low. As the two of them continue caulking the steel copper, brothers Rick and Marty Lagina along with their partner Craig Tester and other members of their Oak Island team welcomed aerospace engineer dr. Travis Taylor to the war room he has come to present his findings after reviewing the underground seismic data the team received earlier this year. According to the scans, it would appear that there is a mysterious underground chamber located some 50 feet deep in the so-called mega bin area, so the team employed sonic drilling in an effort to find it what unfortunately what everyone had hoped was a man-made chamber turned out to be nothing more than a thick layer of sand. Travis Taylor gave the team a new perspective to look from and he helped them immensely. He used his experience and based on radon gas, he managed to find what others missed. 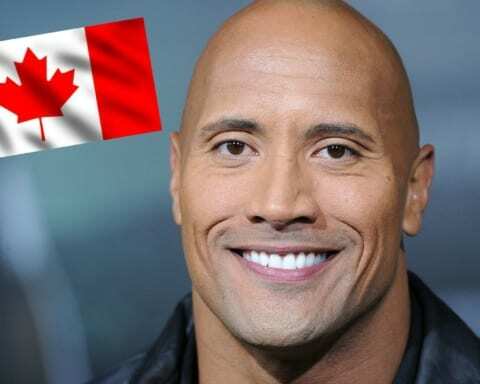 Radon is a radioactive gas and it forms in trace amounts when deposits of uranium, which is naturally found in rocks and soil, breaks down underground. In recent years, radon detection has been used experimentally as a way to map subsurface features in the energy and mining industries. One of the brothers said: “I think what we’ve learned is that seismic isn’t gonna work in the money pit area this is too jumbled up. I always love when somebody thinks is something that had just never occurred to me that’s the best kind of information there is and so Travis Taylor came in with a whole new perspective on maybe how to find cavities through radon testing”. 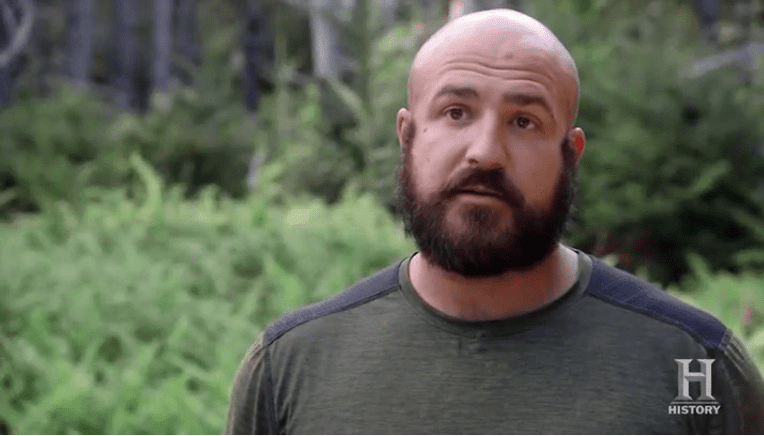 Beginning with Daniel McGinnis, the man who first discovered the money pit in 1795 the ancient fraternity of master builders known as Freemasons have played a large role in the Oak Island treasure story. Prominent Masonic symbols such as the letter G which represents the grand architect as well as the triangle or pyramid have been found on numerous carvings both in and around the island. According to the teachings of Freemasonry Hiram Abiff was the chief architect of King Solomon’s Temple in ancient Jerusalem his so-called drawing template is presented to all freemasons who joined the order’s third and highest degree. 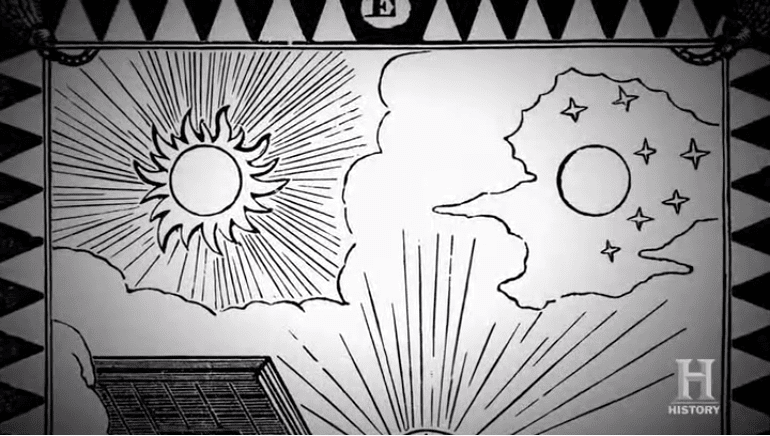 it depicts many well-known sacred images such as Jacob’s Ladder to the heavens and the Holy Grail. A star map matching the constellation Taurus? Two points not only on Oak Island but on two neighboring islands? Where does the map lead? Marty Lagina, Jack Begley and Gary Drayton take Dr. Travis Taylor over to one of the lots – located on the western side of the island. They are eager to investigate various points on the island that are indicated on what Travis believes to be a massive star map. A map which made point and crews that could help the team solve the Oak Island treasure mystery. Having found a stone marker that appears to correspond with one of the places indicated on Travis’s star map the team heads to a second location just south of the money pit site. In 1897 while exploring on the islands southern shore treasure hunter Frederick Blair discovered a mysterious group of round stones that formed a perfect triangle. Even more astonishing was the fact that the apex of the triangle pointed directly towards the money pit. Unfortunately, during a massive excavation conducted by treasure hunter Robert Dunfield in 1965, the so called stone triangle was destroyed and although a replica has been built in its place the precise orientation of the triangle as well as the location of the original money pit shaft remains unknown. 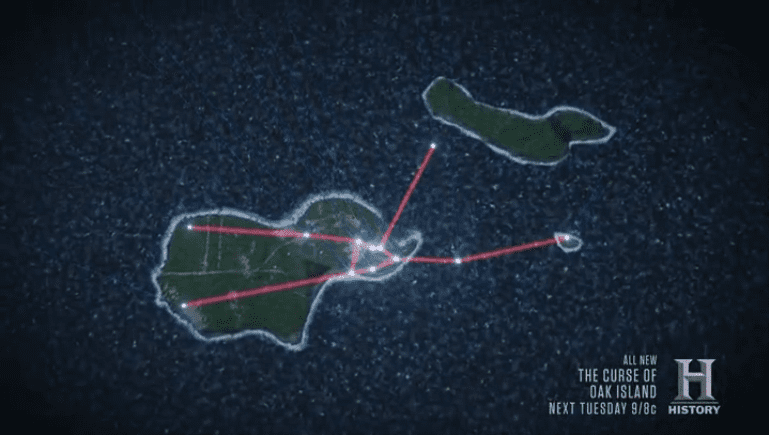 Having already marked to potentially important locations on the island Travis Taylor now uses his star map to lead Marty Jack and Gary to lot 13 where if his theory is correct they will find another stone marker. Before another long day on Oak Island comes to an end Rick Lagina and Dave Blankenship meet with representatives from Irving equipment limited who have come to inspect the structure at stake is whether or not the team’s ambitious plan to excavate the cove can continue. 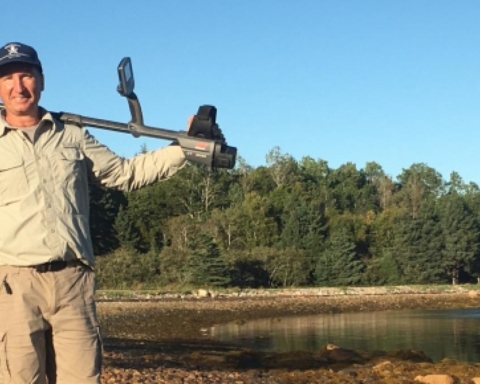 Because Mike Jardine believes the water is not only coming in through the cofferdam but from other natural sources on the island, the Oak Island team will need to dig a trench on the inside perimeter of the cove this will allow water to collect inside it before being pumped out of the area. Careful planning and tireless effort as well as an investment of over 1 million dollars are finally about to pay off as the team prepares to break ground on their massive operation at Smith’s Cove Smith’s Cove. After successfully sealing the leaks in the cofferdam wall and digging trenches to collect and drain out the water the nearly 12,000 square foot area is now dry enough for Rick Marty and their team to begin excavating. Guided by photos and surveys taken during Dan Blankenship’s excavation of Smith’s Cove in the early 1970s, the team is beginning their dig on the northwest side of the beach it is here they hope to uncover what they believe to be is a mysterious u-shaped structure that reportedly lies buried at a depth of some 10 feet. As the team dredges up tons of Earth and material in search of the u-shaped structure they will also carefully sort through piles of spoils by means of their newly installed wash plant the plant will automatically clean and sort the spoils according to size in hopes of uncovering historically important artifacts or possible treasure – such as the medieval cross that was discovered by Rick Lagina and Gary Drayton just last year. 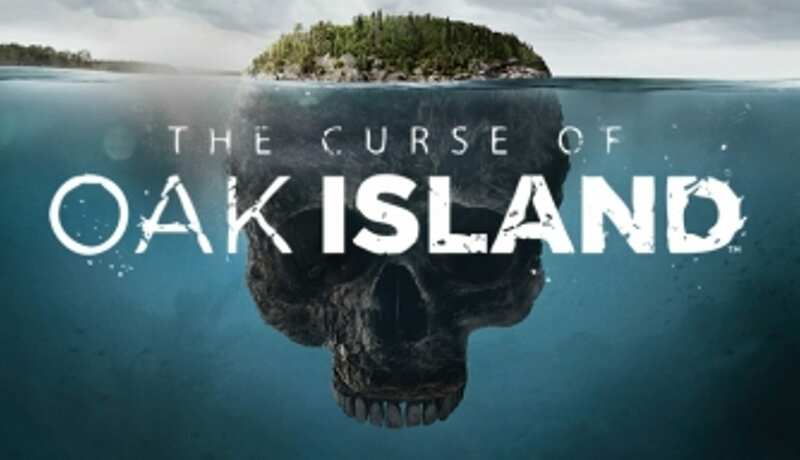 Another episode of The Curse of Oak Island ends but the team has got a lot of things done. The next one is Episode 8 of Season 6 which is titled “As Above, So Below”, obviously referring to Travis’ words. The new episode will be aired on January 15th, 2019! Stay tuned! Next Story Next post: With the stock market on track for worst year since 2008, who’s to blame?